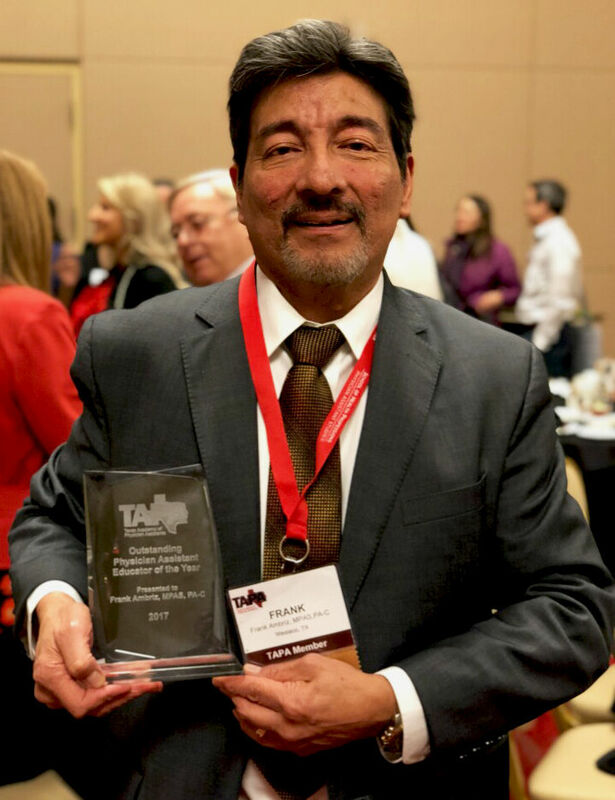 The Texas Academy of Physician Assistants, or TAPA, has awarded Elsa native Frank Ambriz, clinical associate professor at the University of Texas Rio Grande Valley, with the Outstanding Physician Assistant Educator of the Year distinction, according to a UTRGV news release. This is not the first time he was honored with the award after having earned the recognition in 2005. Ambriz works in the physician assistant studies department at the Edinburg campus and also serves as program director for the Master in Physician Assistant Studies bridge program, or MPAS. The associate professor received his bachelor’s degree in biology from Pan American University — now UTRGV’s Edinburg campus — in 1977 and continued his education at the UT Medical Branch at Galveston, where he received a Bachelor of Science degree in physician assistant studies. Over the years, the national board pass rate has climbed from 74 to 98 percent. Above his own doing, Ambriz attributed this increase to dedication from students. Ensuring a student’s success through proper training, he said, has and will continue to be the program’s mission.